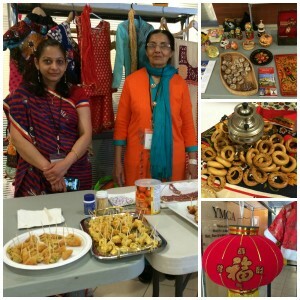 Twice a year, YMCA Calgary LINC students come together to celebrate their cultures with a special Multi-Cultural Event. Recently, the South LINC classes held a beautiful cultural showcase in the lobby of the Shawnessy YMCA, and the North LINC classes took visitors on an exciting road trip around Canada at 1000 Voices in the Genesis Centre. 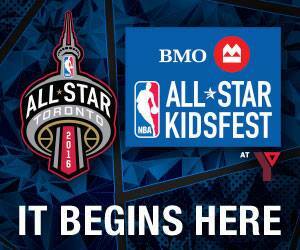 If you missed it, here are some highlights of these exciting events. 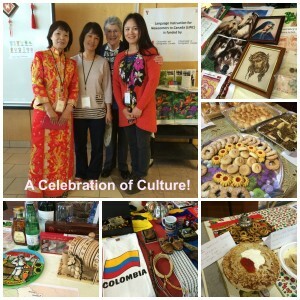 Stay tuned for the next Multi-Cultural Event – we have them every May and November! 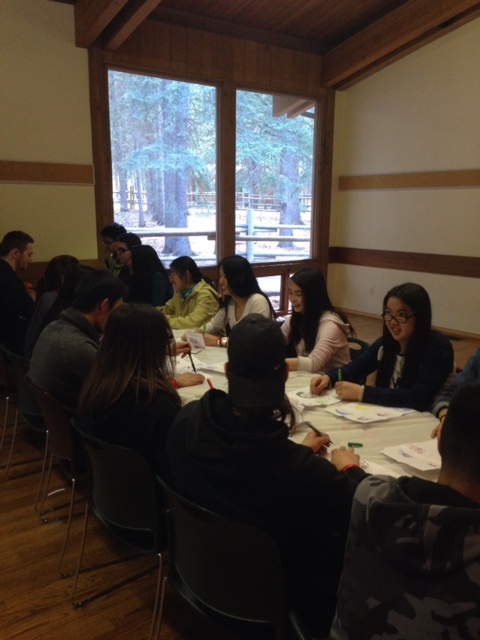 North LINC students worked together in groups representing each province and territory of Canada. 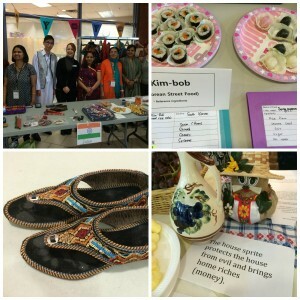 During the event, students set up displays in their classrooms; each room was a different part of Canada. Everyone had a chance to visit each unique area of Canada, and learn about what makes it special. Of course, Alberta and Calgary got a little bit of extra attention! 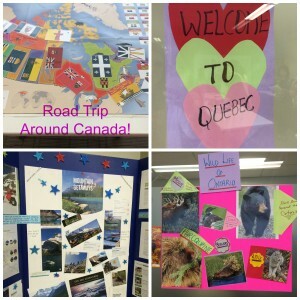 At each stop, students asked questions, collected stickers on a map, and had a chance to win Canada-themed prizes. By the end of the day, everyone had been to every province and territory! 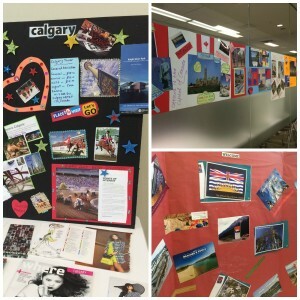 Meanwhile, on the opposite end of Calgary, South LINC students worked together in groups representing dozens of countries from around the world. They showcased their cultures with traditional games, delicious food, beautiful clothing, and lots of music. The event was open to the public, so visitors of all ages from the Shawnessy community were able to experience the fun and excitement of the celebration. Great job, LINC! What a fun and exciting day for everyone. I can’t wait for the next event! Written by Jillian Harbour, YMAP Director, Community YMCA. 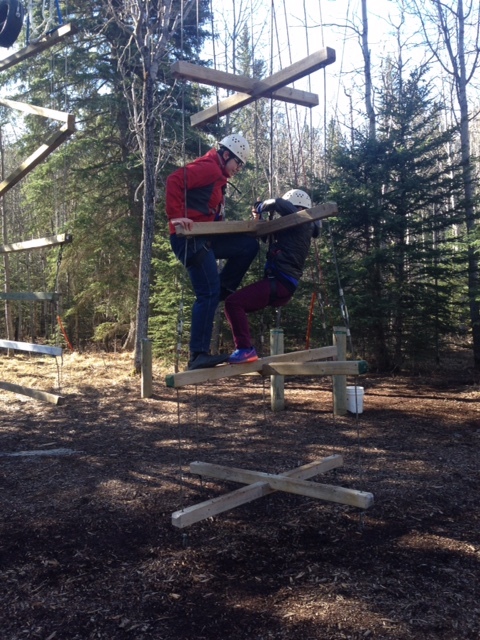 The YMCA Achievement Program (YMAP) had their annual trip to Camp Chief Hector YMCA. 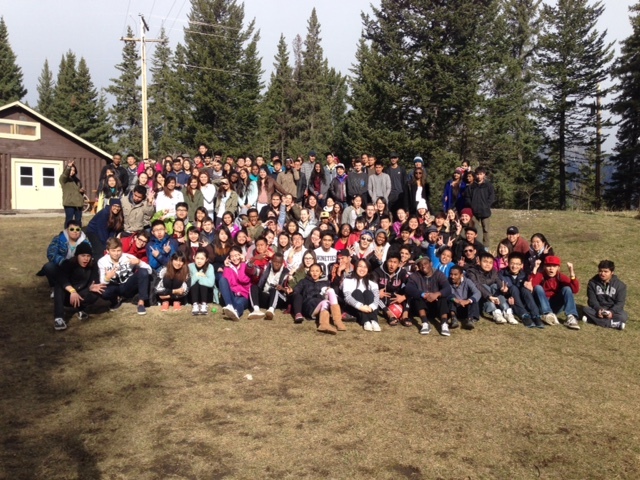 This year we traveled out to Kananaskis Country with an unprecedented 131 participants, 7 volunteers and 5 staff for a weekend filled with games, lots of laughs, new challenges and amazing people (and no snow!). Between the always helpful Camp Chief Hector YMCA staff and the strong leadership Matt and Alisha provided the rest of the team, the weekend was a great success. My favourite moments of the weekend were the ever popular open mic night (I am always blown away by the amazing talents YMAP participants keep secret until camp!) and all the teamwork/encouragement I saw between the youth as they faced new and exciting challenges together. This is often the first experience of its kind for the participants. 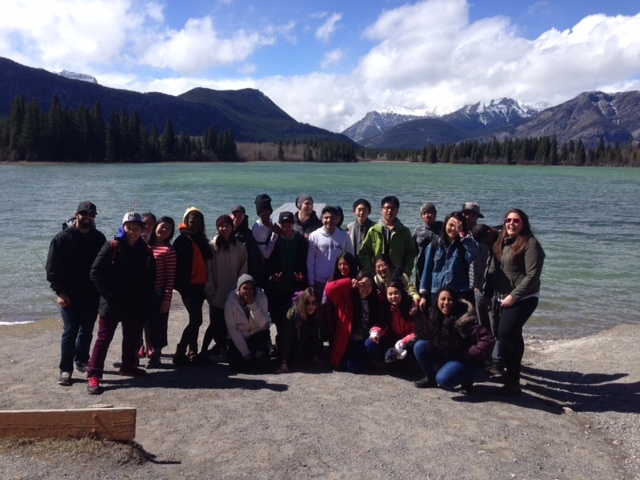 These youth are new to Canada and seeing and experiencing the mountains and the Canadian outdoors for the first time. Over the next few weeks, I will be sharing some stories from my time with Neelam’s class on the YMCA blog. Today, I have two stories to share about the shock of Canadian winters. I think we can all relate to that! Happy reading and stay tuned for the next instalment of LINC Creative Writing. I would like to share my first winter experience in Canada. I didn’t have any idea about how winter weather condition in Canada can quickly become dangerous, often with little or no warning. After my bitter situation, I came to know that Canadian winters are famous for being cold. Heavy snowfall and extreme cold can immobilize an entire city. It was the time of December 2012, my first year in Calgary. I was staying in Calgary alone with my two kids. Environment Canada forecast 30 c.m of snowfall expected during that day. A powerful winter storm hit Calgary & its surrounding areas. At first I was enjoying the weather. Suddenly I felt that I need to buy milk for my little one, who was only two months of age. I decided to go to my neighbouring shop to buy it and come back. I was driving through the locality near my house and my driving speed was 20/25 km/h and I was in the middle lane. Strong winds, extreme cold, heavy snow and ice knocked down some trees on the sides of the road. While driving I came to know that storm has created many hazards, including automobile accidents on icy roads, and that made me feel helpless. Unexpectedly my car skid & it kept skidding until I hit the left curb. I tried to pull my car back but I failed to do so. At the same time my little son started to cry and my big son got scared. After a while, one police car came and stopped behind my car. After hearing everything he helped me to move my car back to my house. That was a memorable day for me, how I was stuck up in the middle of the road. I have learned a lesson from this incident i.e when blizzard hits, stay indoors and wait it out unless it is emergency, and if I must go outside during cold weather I must wear layers of clothing with a wind resistant outer layer, warm socks, a hat and scarf and watch for wind-chill or extremely cold temperatures. My first month in Canada was chaotic. I came to Canada on January 18th in Montreal. In winter time, Montreal has lots of snow. That day, the outside temperature was -23 degrees. I came to Canada alone and it was my first plane journey. I was very confused in Heathrow, the London Airport. The airport is very big and it was complicated for me. I could not find my airplane’s gate. When I saw someone, I asked them and they helped me to find my airplane’s gate. When I was on the plane from London to Montreal, I saw people put 3-4 pieces of ice in a glass of water and they were drinking. I was surprised. Because, the water was already cold but why they put ice? When my plane landed, it was already late. Then I was waiting at a different airplane’s luggage receiving place, because I did not know that different airplanes have a different luggage receiving place. When I did not find my luggage, then I asked a man and he said, “different airplane has a different place”. Then I looked another place and I found it. My husband checked on the airplane’s website and it showed that the plane had landed almost 11/2 hours ago. But I did not come out from the airport. He thought that I missed my plane. After 2 hours, I came out from the airport. Then he picked me up. When we came out from the airport, snow was falling and I saw everything was white, trees had no leaves. He parked his car far away from the airport, because my plane was late and the airport parking ticket is expensive. So, we rode an airport bus. Then, the bus stopped in a metro station. In Montreal, the train station is underground and it was also a new experience. I did not have a heavy winter jacket. My husband brought a jacket for me. But I was still very cold. My husband parked his car on opposite site of the train station. He took one luggage and he rolled it from the station to our car, but I took another luggage and I could not roll it because the snow was falling and it was hard work for me. I saw everyone was driving on opposite side and drivers also sat on opposite side of the car. Everyone followed the traffic rules. When the snow was gone, everything was clean (especially the roads, sidewalks etc.). My first month I found the differences between Canada and my country. When people were talking or asked me questions, I could not understand most of them. That’s why I went outside with my husband. I felt shy. Cutting vegetables with a knife was also challenging. My husband taught me. Now, I can cut very well with a knife. Also I did not know most of the cooking recipes. But I wanted to eat that. So I called my mother and she gave me the recipe. At that time, my husband worked as a radio frequency engineer. Sometimes, he lived 4-5 days in Halifax, 2-3 days in Newfoundland and 6-7 days in Toronto. So, I lived alone in my home. I felt bored. I didn’t know Canadian culture, rules etc. At that time, I had some bad experiences, but I had some good experiences that made me really happy. That’s why, I said my first month in Canada was chaotic. Peace is advanced through the everyday actions of ordinary men, women and children. Young or old, working alone or in groups, locally or abroad. These peace-builders know that even small acts of kindness, courage, and understanding make a meaningful contribution to a better community and a more compassionate world. Nominations for 2014 Peace Medals Recipients are now open. We are now accepting nominations for our 2014 Peace Medals recipients. The recipients will be honoured at the 2014 Peace Medals event happening on Wednesday, November 19, 2014, during YMCA Peace Week. YMCA Peace Medal nomination is a great way to honour someone for their dedication to peace. Your nomination also helps create awareness about community needs and inspires others to get involved. Help us celebrate and honour outstanding Calgarians. Contact Selena Gignac, International and Community Outreach Manager at 403-899-4047 or sgignac@calgary.ymca.ca for more details. Undercover Boss Canada Featuring YMCA – Full Episode! Did you miss last night’s episode of Undercover Boss Canada featuring Canadian YMCAs, including our very own Eau Claire YMCA?